2017: a year of momentous anniversaries giving cause to reflect on the past and present fight for the rights of Aboriginal and Torres Strait Islander peoples. 2017 marks the 50th anniversary of the successful 1967 Referendum to include Aboriginal and Torres Strait Islander people in the census, and the 25th anniversary of the landmark decision by the High Court of Australia in Mabo v. Queensland (No. 2) that reversed the principle of terra nullius and resulted in the recognition of native title. These two dates mark the beginning and end of National Reconciliation Week; an important week to reflect on our shared histories, cultures and achievements and to explore how each of us can join the national reconciliation journey. A trip to the national capital is a great opportunity to build your students’ understanding of Aboriginal and Torres Strait Islander histories and cultures—a cross-curriculum priority within the Australian Curriculum. Iconic institutions like the High Court of Australia, Old Parliament House and the Aboriginal Tent Embassy are inextricably linked with the discussions and decisions that pave the way for the recognition of the rights of Aboriginal and Torres Strait Islander people in Australia. Come and experience these institutions first-hand, gain a deeper understanding of the issues through an education program, exhibition, tour or get involved in a special event. 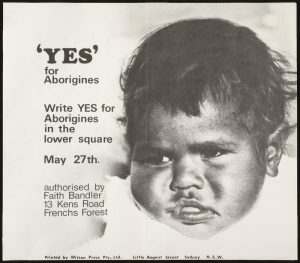 Poster for the Indigenous referendum, 1967. National Museum of Australia. At the National Museum of Australia, students explore Aboriginal and Torres Strait Islander dynamic living cultures, contact histories, and the fights for rights and freedoms, using objects, discussion and ICT. Programs are available for students in all year levels. In the museum’s primary program, A Living Culture, students explore how Indigenous peoples lived in Australia before European settlement, and the ways in which Indigenous cultures have adapted and evolved since 1788. In the museum’s secondary program, Indigenous Rights and Freedoms, students learn about key Indigenous and non-Indigenous people involved in the struggles for civil and land rights. In 2017, the Museum of Australian Democracy joins with the Australian Institute of Aboriginal and Torres Strait Islander Studies to present a special exhibition in the Living Democracy exhibition space to mark the 50th anniversary of the 1967 Referendum. The exhibition uses artefacts, objects and audio-visual material to showcase the issues, the key people, and how they made their voices count in our democracy. At the National Archives of Australia, students can explore original records documenting Aboriginal and Torres Strait Islander people’s struggle for recognition and land rights in the This is our Land education program, or find Indigenous ANZACs’ war service records online at www.discoveringanzacs.naa.gov.au. The National Library of Australia is home to the Mabo case manuscripts that include the papers of Edward Koiki Mabo (1936–1992), the leading plaintiff in the case. In 2001, this collection was inscribed on the UNESCO Memory of the World Register. 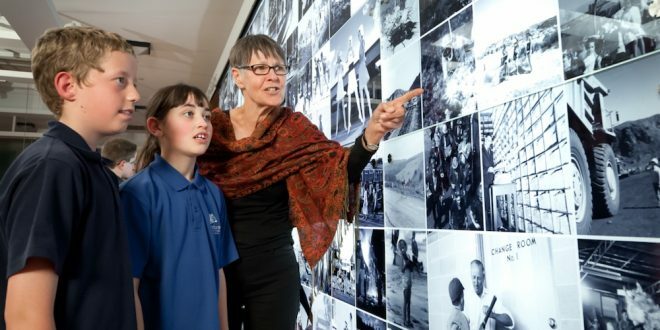 Give your students the opportunity to engage with Mabo’s epic battle for land rights, and its legacy, by viewing original material on permanent display in the Library’s Treasures Gallery. Oodgeroo Noonuccal at Moongalba 1982, by Juno Gemes (b. 1984) selenium toned, gelatin silver photograph. Collection: National Portrait Gallery, Canberra. Purchased 2004. Visit the National Portrait Gallery to see Eddie Koiki Mabo in a powerful portrait by Gordon Bennett that boldly combines image and text. The portrait reveals Eddie Mabo’s persistence, patience and positivity in working to achieve recognition of Native Title through the long process that ended in the High Court decision of June 3, 1992. Many of the Aboriginal and Torres Strait Islander peoples who have made their mark on Australian history, creativity, identity and culture are here too. 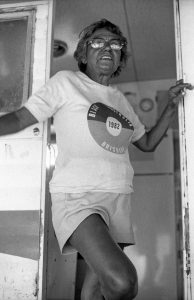 They include those who worked towards equal rights and many who campaigned for the 1967 referendum including Oodgeroo Noonuccal, Charles Perkins and Faith Bandler. Take a guided walking tour of nearby Reconciliation Place to explore the public artworks. Led by the National Capital Authority’s knowledgeable guides, tour topics include the 1967 Referendum and the Mabo decision, set in the context of our shared journey. Students are invited to experience the artworks through both touch and interpretation. From March 2017, the National Archives of Australia presents Facing Two Fronts: the Fight for Respect examining Indigenous war service and the fight on the home front for recognition. Indigenous Australians at war from the Boer War to the present, is a touring exhibition from the Shrine of Remembrance and is on display at the Archives in Canberra from March 23 to July 16, 2017. Explore Indigenous military service in times of war and peace in the Australian War Memorial exhibition, For Country, for Nation, showing until September 20, 2017. Opening Ceremony and Debating of Bills in the House of Representatives Chamber. 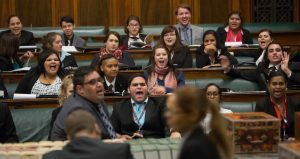 National Indigenous Youth Parliament 2014. Photography by Andrew Taylor. Next Why do schools want all students to look the same?